For the last month or so, I’ve been on a book-collecting spree. I knew for a while that I was going to do World History for the Level 8 plans. Then, I got my hands on a copy of The Story of Science: Aristotle Leads the Way at my local library. I fell in love. I knew I loved Joy Hakim’s writing style, from the History of Us series. After reading some of her science series, I knew I needed to incorporate them into Build Your Library somehow. And then it hit me – why not do a History of Science for Level 8? And why not weave in World History as well to round it out a bit more? So, rather than just a crash-course in World History, it’s become a hybrid of History of Science through World History. You’ll still touch on all the important historical events, but you’ll be seeing them through the lens of the scientific world. As I started scheduling the three Story of Science books and weaving in the history, I got more and more excited. 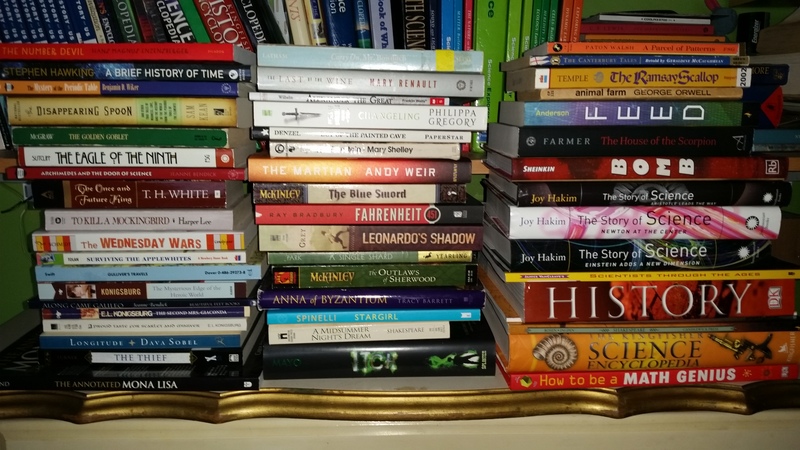 I have a huge pile of books – not all of them will make the cut and end up in the curriculum – but I am aiming for a science-theme. So the books range from classics to modern YA, to science fiction to living science books. I’m even hoping to work in some living math! I’m really excited to dig in – I’ve nearly finished scheduling the science/history portion and I already know this is going to be an incredible year! I’m really looking forward to seeing what you do for 8th grade. You are working with some of my favorite books- and happily, my daughter will be in 8th grade next year. When, oh when will it be ready? I hope to have it ready for purchase by the end of May, but mid June at the latest. After purchasing some unit studies, my kids are so excited to have this be the curricula for our next homeschool year! I am excited to see them learn. How exciting!! I was a little nervous about finding something good when we finish 7th grade. I was looking at doing Story of Science on our own- because I think it’s wonderful. This will be *perfect* for us. I’m in line to buy the 8th grade curriculum! I have been doing a history of science approach with my daughter this year and will continue next year. Love the Hakim books. Have you looked at the new Bauer book The Story of Science? I’m only to chapter 3, but so far I find it to be very interesting. I will probably have my 7th grader give it a try after I have finished reading it. I haven’t gotten a copy of the Bauer Story of Science yet. I do plan on picking up a copy in the very near future though. I’m thinking this would make a nice addition for my high schooler as we study the History of Science.